So onto… what to eat. Colder weather means comfort food, and while mashed potatoes, pot pies, and cheesy baked dishes may come to mind first, soup and sandwiches are a great, and possibly lighter alternative. This week we decided to bring you grilled sandwiches three ways, but really, the possibilities are endless. Our three versions are all made on our whole wheat brioche, making the bread rich, yet still on the healthy side. 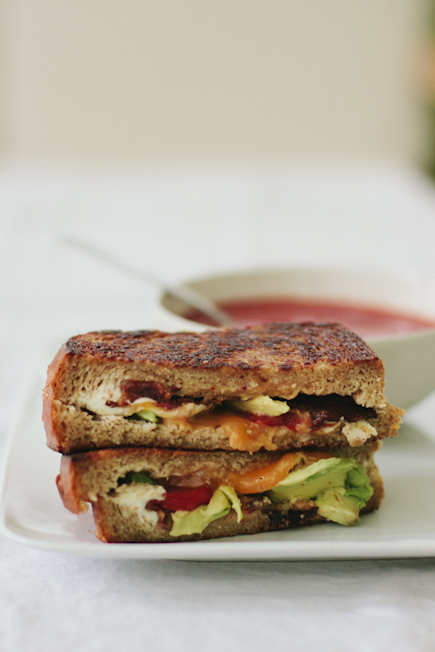 We jazzed up the classic cheese and tomato by adding bacon and avocado, (trying to recreate a favorite sandwich served at the Wilde Roast Cafe here in Minneapolis), and for the second one got a little fancy with pears, basil, and smoked mozzarella. 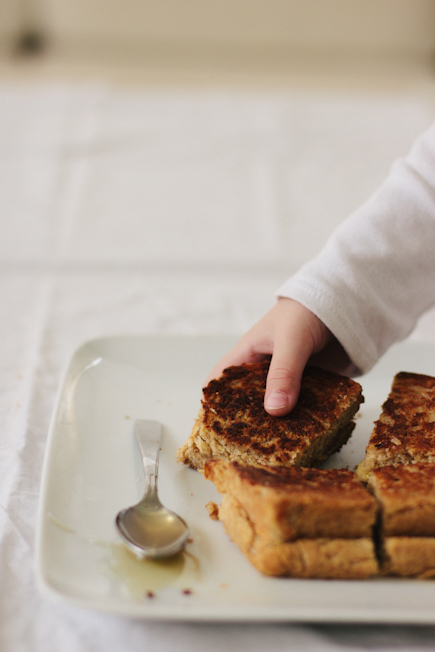 The third sandwich is kid-friendly; we thought honey, peanut butter, and bananas would be a perfect lunch or after school snack. 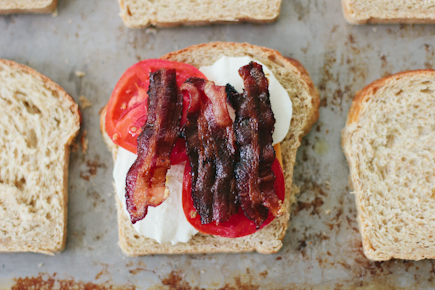 There are a lot of recipes for grilled sandwiches, complete with tips and tricks for the perfect outcome. I find using a cast iron skillet helps brown the sandwich nicely, but a non-stick will work just fine, too. Heat 1 tablespoon butter over medium-low heat, and add the sandwich when the butter begins to sizzle (oil works too). Cook each side until golden brown and the cheese has melted, 2-4 minutes per side. I like to press down on my sandwich a bit as I cook it, to help compress it a bit and give it a nice golden sear. 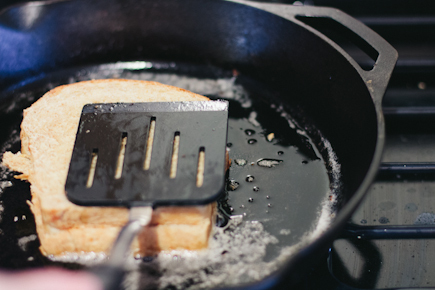 Another option is a grill pan and press; see our post on panini sandwiches. And there you have it! A delicious, comforting meal. As I mentioned before, the options are endless, and while we loved how they tasted on whole wheat brioche, you can feel free to substitute our other breads as well. Our gluten-free boule would also make a delicious sandwich. ‘Classic’ Grilled Cheese: sharp cheddar, fresh mozzarella, cooked bacon, tomato, and avocado [the avocado was put on after cooking]. 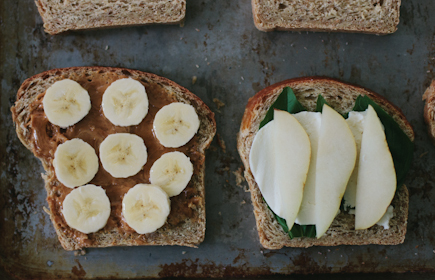 Kid-friendly Sandwich: peanut butter, honey, sliced bananas [Nutella would be good here, too]. Congrats Sarah! That’s awesome! 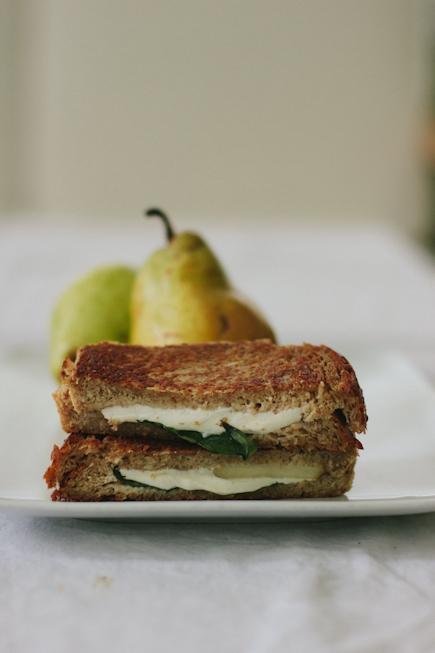 I must say, that Pear Basil sandwich with smoked mozzarella sound simply divine. I might have to make that one really soon. so exciting to know sarah will be joining you. i’ve followed her blog, as well as facebook and pinterest pages, for quite a while. she’s just delightful. and her images are such a lovely addition to your offerings here! How lovely! Ditto to everything Lisa wrote above! Sarah…….I am sooooooooooooooo proud of you!! Great work!! An old diner trick I read about is to use Mayonnaise (Regular, not low fat or no fat). Spread it being careful to get all the way to the edges and use a lower heat or it will burn. The result tastes better, browns beautifully, and has a bit less fat. I’ve done side by side comparisons and the mayo sandwiches definitely taste better and are less greasy. Oh, and don’t try Miracle Whip, it won’t work either. Looking forward to this new writer and photographer! I celebrated by picking up the ABin5 kindle book, too. Thanks, we are very excited to have Sarah on board! Do you have a recipe to make the rice bread without eggs? I have never tried it with the rice bread, but you can try using ground flax seeds, like I did in this post: http://artisanbreadinfive.com/2010/06/01/gluten-free-baguettes-egg-free-and-a-king-arthur-gluten-free-flour-giveaway I would make a smaller batch of dough to make sure you like the results. Other readers have used egg replacer with good results as well. The crumb was much more dense than the photos from your dutch oven post. Mine looks more like sandwich bread. Any suggestions? And relatedly, is there any way to combine some sort of pre-ferment, like a poolish, with the master recipe? The bread is delicious but I’d like a little more flavor. Is it possible to achieve both, a better crumb and some more flavor by using a pre-ferment? Jump starting the flavor in your dough: http://artisanbreadinfive.com/2009/11/30/sourdough-starter-in-our-recipes Or you can use a pâte fermentée, which you probably know is a piece of “old dough” to jump start the flavor of the next batch. We also recommend that you start a new batch in a bucket that has the remains of the last ‘aged” batch of dough. This probably is a not-so-smart question, but I have recently started using your master recipe. I would like to replace store-bought bread with this bread.However, my family doesn’t like the rounded shape for sandwiches. I notice the bread in this post is a traditional sandwich-shaped bread. Can the breadinfive be made in a bread pan or how did you achieve the above shape? You can do it in a bread pan– which book do you have and I’ll direct you to page numbers where we describe? Thanks for responding! I actually haven’t bought a bread pan yet. So any suggestions or reference pages will be helpful in that choice.